An adjustment layer in Photoshop Elements 11 is a special kind of layer used mostly for color and contrast correction. The helpful aspect of adjustment layers is that you can apply those corrections without permanently affecting any pixels on your other layers. Adjustment layers are nondestructive. They project the correction to all layers below them without affecting any layers above them. Because the adjustment resides on a layer, you can edit, delete, duplicate, merge, or rearrange the adjustment layer at any time. You have more flexibility in your image-editing chores and more freedom for experimentation. Additionally, none of this experimentation harms your image, because it takes place above the image on an adjustment layer. Another unique feature of adjustment layers is that when you create one, you also create a layer mask on that layer. A layer mask is sort of a second sheet of acetate that hovers on the underlying layers. You use the layer mask to selectively apply the adjustment to the layers below it by applying shades of gray — from white to black — on the mask. For example, because the mask is, by default, completely white, you can fully apply the adjustment to the layers. If you paint on a layer mask with black, the areas under those black areas don’t show the adjustment. If you paint with a shade of gray, those areas partially show the adjustment. The darker the shade of gray, the less these areas show the adjustment. Note that if your image has an active selection border in it before you add an adjustment layer, the adjustment is applied to only the area within the selection border. The resulting layer mask also reflects that selection: The selected areas are white, and the unselected areas are black. You can also apply a layer mask at will and use it to creatively blend two or more layers. Elements has eight kinds of adjustment layers, and you can use as many as your heart desires. The adjustments offered are, for the most part, the same ones you find on the Enhance→Adjust Lighting and Enhance→Adjust Color submenus. In the Photo Editor, in Expert mode, open an image of your choice. Because you’re applying an adjustment layer, you may want to use an image that’s in need of some color adjustment. Note that when you use adjustment layers, you don’t need to convert the background into a layer. 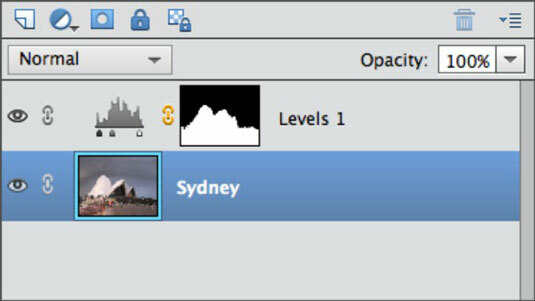 Click the Create Adjustment Layer icon in the Layers panel. The Adjustment Layer drop-down menu appears. You can also choose Layer→New Adjustment Layer and then choose an adjustment layer type from the submenu. Name the layer, leave the other options at their defaults, and click OK.
From the drop-down menu, choose an adjustment. The dialog box pertaining to your adjustment appears in the Adjustments panel. Make the necessary adjustments in the particular Adjustments panel. 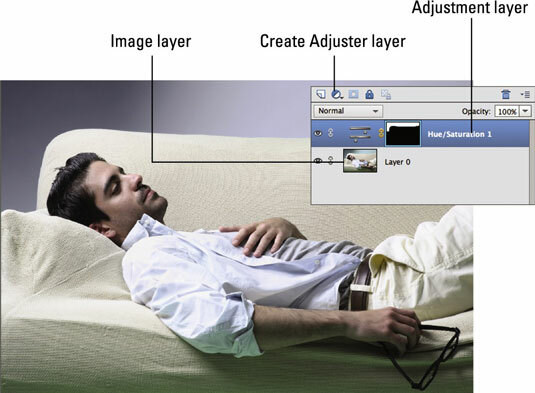 The adjustment layer appears in the Layers panel. The Adjustment Layer icon (sporting a few gears) and a thumbnail (representing a layer mask) appear on the adjustment layer. When you first apply the adjustment layer, the mask will appear white, enabling your adjustment to be applied at full strength over the entire image. However, in the example, the layer mask of the Levels adjustment layer is black and white. Where the mask is white, the adjustment shows up over the image at full strength; where the mask is black, the adjustment doesn’t appear at all. This was achieved by painting on the layer mask to allow only portions of the image to receive the adjustment. This was also done to the Hue/Saturation adjustment layer. Use the Brush or Pencil tool to paint. Or, you can also make a selection and fill it with any shade of gray, from white to black. Finally, you can use the Gradient tool on the mask to create a gradual application of the adjustment. You can also adjust the opacity and Blend modes of an adjustment layer, just as with image layers. Reducing the opacity of an adjustment layer reduces the effect of the adjustment on the underlying layers.